Ocean Base is the third zone in Sonic Advance 3, and is set inside a secret underwater base on the seabed. The first two Acts are rather vertical stages that can get confusing if you intend to rush your way through the zone blindly. 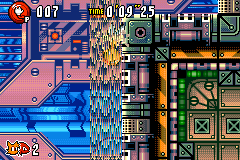 All three acts in the zone feature polluted water and waterfalls that work similarly to the sand falls of Sandopolis Zone that Sonic and co. can ascend to get to higher areas. Despite the presence of water, the player doesn't have to spend much time in it due to the vertical nature of the zone. Other obstacles include giant crushers (some of which will sprout spikes a short while after you land upon them), water slides, Uutsubos that pop out of walls and spike pits. Gimmicks here include giant fan propellers that slowly rise as you jump upon the center (similar in appearance to a smaller gimmick in Sonic Advance 2's Sky Canyon), cannons that fire directly upwards, conveyor belts, transport tubes and rails that sometimes offer an alternative path to underwater routes. Jousun - A swordfish badnik that will ram into the player. Commonly found by waterfalls, making them tricky to avoid. Takkon - An octopus badnik that flies about in one spot, spitting ink downwards. Uutsubo - A moray eel-like badnik that pops out of walls to ambush the player.